This may have been the most craziest miles on the trail. At some point in between these two fine southern Towns I started to hike with Ontario and Cool Hand (if you two crazy kids can read, shout out to you). 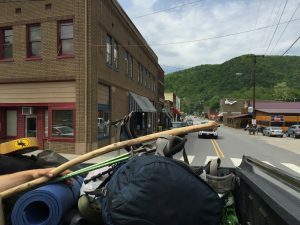 We had read in the AWOL (the unofficial trail guide of the AT) that there was an AYCE (all you can eat) pizza place in Erwin so we started to brainstorm ideas on how to get to Erwin ASAP. After much more examination of this guide book we also found that there was an AYCE Kentucky Fried Chicken in Erwin as well. Hiker Heaven. We thought we could put in some big miles in order to do both in the same day. After some brainstorming sessions we came up with the perfect plan. Hitch from Devils Gap and get KFC and then hike 30 miles more and get pizza in two days. So we get to Devils Gap and hitched into Erwin. Great hitch – three of us rode in the back of a pick-up truck for 30 minutes. The KFC buffet was nothing short of glorious. After we ate our hikers share of KFC we had zero idea of how we were going to get back to Devils Gap. So we had to stay in downtown Erwin that night and by stay in downtown Erwin I mean we set up our tents and hammocks in downtown Erwin. We camped responsibility so no need call the cops on us, even though I probably shouldn’t disclose exactly where we camped. We woke up the next morning and called the hiker hostel (Uncle Johnny’s) in Town and took a shuttle to the hostel. At some point during this time we decided that we really wanted pizza ASAP, so we came up with a plan to slack pack (slack packing is where you don’t carry your normal 30 pound pack, you get a day pack and pack the essentials, food and water) from Devils Fork to Erwin in one day/night. We got out small packs together, charged our phones and mentally prepared for a 33 mile hike. We started this hike at 1 in the afternoon. So normally, hikers hike about 2 miles an hour, so you can do the math on this. We were going to be hiking well into the night. The day started off well. We took some pictures of waterfalls, talked with other thru hikers that we knew and took pictures of some great views. As we were approaching a bald around 7 pm it started to thunderstorm. We were 100% soaked from head to toe, and still had about 19 miles to go. We start to hustle to the nearest shelter. We get to this shelter at about 8 pm and start telling other people our plans. They laughed and informed us that we still had 17 more miles to hike in the pouring rain. We eat some protein bars and give our best to these hikers tucked away nicely in their sleeping bags. We start to do our remaining 17 miles in the dark and the rain. Around 10 pm we take shelter under a rock ledge, talk about how cold we are and share some snacks. We finally get to a sign that tells us that we are 11 miles from our destination. Those 11 miles were the longest 11 miles that I have hiked. We make one more stop around 1 am and eat our remaining food. We hike the final 5 miles and get to Uncles Johnny’s at 3:45 am and try to fall asleep on the porch. Around 6 am another hiker (Mercury) comes out of his bunk to start his day. He let us crash in his bunk for the remainder of the night; thank you Mercury, that’s some trail magic right there. All in all a great experience, got some miles in and most importantly AYCE KFC and pizza. Only eat one Pure Protein bar a day. These bars can also act as laxative. Who knew? It’s a little hard for me to upload pictures to the blog. If you want pictures. Go on over to the instagram and type in AlanJGoodwin. It is easier for me to upload pictures to the ‘gram.